In a letter to the New York Times last February, I wrote about an emergency safety net plan to feed millions of hungry Yemenis suffering from high food prices. Since that time, child malnutrition in some parts of Yemen has increased so much as to rival famine-ravaged Somalia. Neither UNICEF nor the UN World Food Programme (WFP) received enough funding during 2011 to carry out their full hunger relief missions in Yemen. These UN agencies rely on voluntary donations from the international community. If donors do not contribute, then hunger relief missions have to be scaled back or in some cases halted. So what can someone do? Take action! UNICEF has a relief fund for Yemen. The World Food Program USA is also hosting a Yemen fund. You can even sign a petition to help WFP fight hunger in Yemen. Or you can take in a “silent guest.” Starting in the holidays of 1947, the United States helped starving countries with a “silent guest” program. At mealtime, people were asked to imagine a silent guest at their table. Then they could mail the cost for feeding that silent guest to a committee in Plymouth, Massachusetts. This donation would buy a CARE package which was sent to hungry people in war-devastated Europe. Today, maybe at your next meal, you could take in an infant child in Yemen who needs plumpy’nut to prevent potentially deadly malnutrition. You could send that donation to UNICEF which provides the plumpy so it can help treat all the cases of child malnutrition in the country. Some of the countries who benefited from silent guest donations back in 1947 were Italy, Austria, France, and Greece. At that time Greece was recovering from a famine and facing a civil war. Another country helped by the silent guest program was Germany. It is Germany that today has taken the lead in helping fight hunger in Yemen with a recent donation of $31 million to the WFP mission. 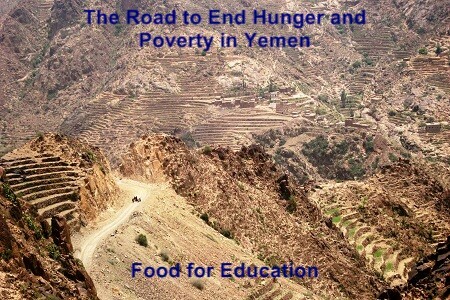 WFP will need over $200 million to feed millions of Yemenis during 2012. The rest of the international community should follow Germany’s lead. The donation from Germany will help the emergency safety net plan which includes rations for 1.8 million Yemenis and also plumpy for infants. A school feeding program which has faced severe cuts over the last couple of years is getting a restart too. The WFP Food for Education plan, which distributed take-home rations to schoolchildren, was suspended in 2010 and did not resume until May of 2011. Then it was a limited distribution, not even close to the previous levels of about 115,000 students. These rations benefited the children and their families. It’s food for the body and the mind as it keeps children in school and learning reading, math, science, and writing. As significant as Germany’s recent donation is, it will be able to help revive Food for Education only to almost half of what it once reached in terms of students. So there is a long way to go to get all these hunger relief plans fully active again. The choice with Yemen is simple. Invest now and avert an epic disaster like Somalia faced. We can save a generation of children in Yemen from the malnutrition that damages or even kills them in the first years of life. Or drift along, pretending that Yemen will somehow turn out OK with an average response to humanitarian needs. It won’t, because no nation can have peace, political stability, and development on empty stomachs and malnourished bodies and minds. Article first published as How a Silent Guest Can Help Save Hungry Yemen on Blogcritics.